Things hap­pen fast on so­cial me­dia. This week­end at The Calgary Expo in Alberta, Canada a col­lec­tive known as the Honey Badger Brigade were ac­cused of wrong‐doing by peo­ple on so­cial me­dia and then very quick­ly re­moved and banned from the event. There has been a lot of noise, fury and com­pet­ing sto­ries on this is­sue, so I find it best to de­tail all the in­for­ma­tion I have been able to gath­er so far. First of all the Facts: What happened and in what order? The Honey Badge Brigade raised al­most $10,000 in crowd­fund­ing to bring some of their mem­bers, in­clud­ing com­ic artist Alison Tieman, and their mer­chan­dise to Calgary Expo 2015. Their stat­ed goal was done open­ly: pro­mote free­dom of ex­pres­sion with­in gam­ing. On Friday, some con­ven­tion at­ten­dees and a num­ber of peo­ple not at­tend­ing the con­ven­tion took to so­cial me­dia to re­mark on the “GamerGate booth” they were see­ing. This is where the mis­in­for­ma­tion start­ed, as they were the Honey Badgers who hap­pened to be sell­ing mer­chan­dise, some of which in­clud­ed: mer­chan­dise bar­ing GamerGate lo­gos and the mas­cot Vivian James. Accusations that they had dis­rupt­ed a Women in Gaming pan­el was lev­eled by some at­ten­dees. 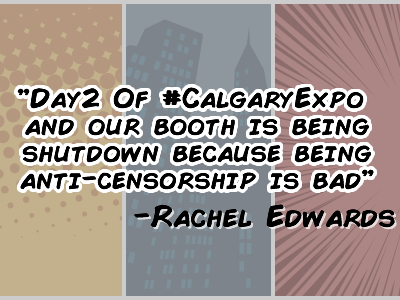 #ClargaryExpo ex­plodes as a hash­tag, with peo­ple tweet­ing sup­port for the Honey Badgers as well as oth­ers con­demn­ing the “GamerGate Booth.” Confusion about what was ac­tu­al­ly go­ing on start­ed run­ning ram­pant. Within a short pe­ri­od of time, Rachel Edwards, a Honey Badger mem­ber on the con­ven­tion floor, con­firms that the booth is be­ing tak­en down and they are be­ing re­moved from the con­ven­tion. This is con­firmed by oth­er con­ven­tion at­ten­dees. 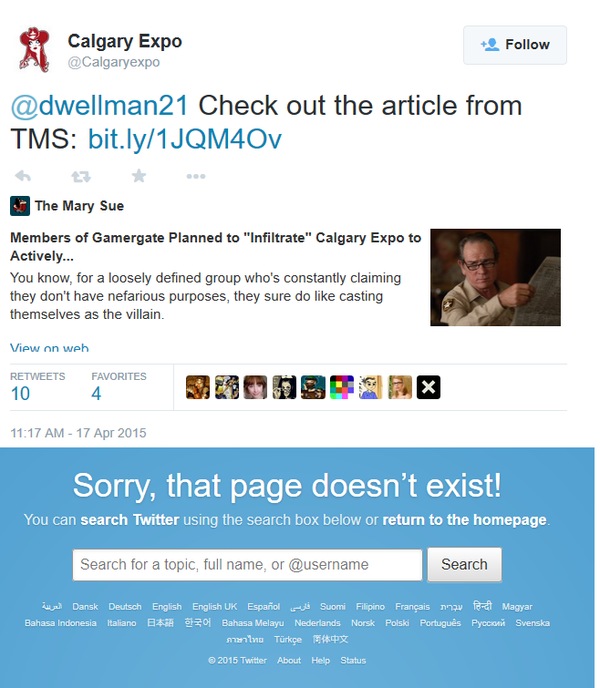 Calgary Expo posts and then lat­er deletes a tweet link­ing to a Mary Sue ar­ti­cle, pur­port­ing the ar­ti­cle to be the ex­pla­na­tion for why The Honey Badgers were kicked from the con­ven­tion, even­tu­al­ly putting out an of­fi­cial state­ment lat­er. It is worth not­ing The Mary Sue is af­fil­i­at­ed with the event. A Voice for Men al­leged that not only had the booth and at­ten­dees been re­moved, but mem­bers had been is­sued a life‐time ban from all events owned by the event or­ga­niz­ers, which in­cludes fe­male comics’ artist and cre­ator Alison Tieman. The Honey Badgers also re­leased the au­dio of the “con­fronta­tion” at the pan­el and a raw unedit­ed ver­sion of the Women in Games pan­el. Early this morn­ing, Fan Expo Canada banned Honey Badger Brigade (HBB) from the Calgary Comics and Entertainment Expo (CalEx). Security staff ap­proached the HBB booth, or­dered us to leave, and re­fused to state the rea­son why un­less Alison Tieman agreed to speak to them away from the oth­er mem­bers of the group, with­out record­ing. They in­formed Alison that they had re­ceived com­plaints on so­cial me­dia, in­clud­ing 25 al­le­ga­tions of ha­rass­ment. No ev­i­dence was pre­sent­ed, no re­quest was made for in­for­ma­tion from HBB, and no spe­cif­ic in­ci­dent was cit­ed un­til fur­ther ques­tions were asked of se­cu­ri­ty. Upon fur­ther ques­tion­ing, se­cu­ri­ty men­tioned the Women in Comics pan­el dis­cus­sion from the pre­vi­ous day, where Alison was giv­en per­mis­sion to speak. Alison spoke briefly in re­la­tion to a top­ic brought up by the pan­elists. Accusers, how­ev­er, claimed that Alison de­railed the con­ver­sa­tion. Alison and my­self were in at­ten­dance, and you can lis­ten to Alison’s state­ment in the pan­el here on YouTube. You can hear Alison, my­self and in­deed the en­tire pan­el in the full dis­cus­sion record. As you will hear, there was no ha­rass­ment. Expo staff and mob rule, in their cru­sade for end­ing ha­rass­ment against women, ha­rassed the Honey Badgers de­spite hav­ing no ev­i­dence of any pol­i­cy vi­o­la­tion. To those un­fa­mil­iar, HBB was found­ed by three women and has a high­ly di­verse staff of vol­un­teers, cre­ators and lovers of free ex­pres­sion. Alison Tieman, a woman who spent 7 years writ­ing graph­ic nov­els and fight­ing cen­sor­ship, was cen­sored by oth­er women for speak­ing her mind, and ad­vo­cat­ing equal com­pas­sion for men, and true strength in char­ac­ter for women. We ask all in­volved to ques­tion what it means to pro­vide an open fo­rum, and to ex­am­ine how CalEx treats it’s pa­trons and ex­hibitors. Do they pro­vide a safe space from ha­rass­ment, or a safe space for the peo­ple who want to de­fine what ha­rass­ment means? Please send press in­quiries to xenospora@gmail.com for more in­for­ma­tion as the sto­ry de­vel­ops. Also be sure to fol­low us on Twitter. Immediate Media cov­er­age fol­lowed. Headlines like “GamerGate Booth Kicked Out Of Canadian Comic Expo” abound­ed with many pub­li­ca­tions par­rot­ing The Mary Sue’s line of a “plan of in­fil­tra­tion,” prais­ing the expo for ex­pelling the Badgers. Kotaku us­ing the head­line “GamerGate Booth” is par­tic­u­lar­ly disin­gen­u­ous, as that was one of the myths even the Expo it­self tried to dis­pel — once again serv­ing as an ex­am­ple of over­sim­pli­fied and dis­hon­est click­bait. The word “in­fil­tra­tion” im­plies that the con­ven­tion was closed off to these view­points from the start. Why would the “Straight White Patriarchy” that holds all the pow­er, ac­cord­ing to their in­ter­nal log­ic, have to “in­fil­trate” any­thing? Their lies ex­pose their in‐build big­otry: that some­one who sup­ports GamerGate should not and would not be al­lowed to at­tend an expo. Once again, very lit­tle right of re­ply is giv­en and once again judge­ment is rushed to with­in hours if not min­utes in the race to be first, but not the race to be ac­cu­rate. Where Does This Leave the Convention Circuit? What it comes down to is this: You can’t con­trol who is and isn’t in a fan­dom. When you have com­ic artists threat­en­ing to boy­cott any con­ven­tion that has true equal rep­re­sen­ta­tion then you have a prob­lem. When you have mobs of peo­ple on so­cial me­dia dic­tat­ing who can and can’t stay in the con­ven­tion hall then you have a prob­lem. Gaming and Comic con­ven­tions are not the po­lit­i­cal play­things of the or­ga­niz­ers, or for a hand­ful of big names. They be­long to the com­mu­ni­ty, to the fans. If there is suf­fi­cient eco­nom­ic de­mand for The Honey Badgers and they keep with­in the rules of the con­ven­tion then there is no rea­son to re­move them be­yond sheer ide­o­log­i­cal big­otry. From the ev­i­dence in front of me and from pri­ma­ry sources, in­clud­ing a record­ing of the en­tire Women in Comics pan­el, I think I can safe­ly draw this con­clu­sion: Calgary Expo eject­ed the Honey Badger Brigade un­der pres­sure from out­spo­ken in­di­vid­u­als on so­cial me­dia and made up a rea­son for their re­moval af­ter the fact. The seem­ing lock‐step with The Mary Sue and lat­er dele­tion of their tweet shows their al­leged rea­sons shift­ing as things un­fold. By the time they had come up with their, frankly, emp­ty state­ment, The Honey Badgers had al­ready been eject­ed from the con­ven­tion hall with no dis­cus­sion or op­por­tu­ni­ty to de­fend them­selves. They got rail­road­ed, this is a farce pred­i­cat­ed on, at best, dis­hon­est bend­ing of con­ven­tion po­lices and, at worst, flat‐out ma­li­cious lies. Through the se­ries of events that took place, I see no way to jus­ti­fy their re­moval and ban­ning. I had feared things would progress like this since last year, but to ac­tu­al­ly see a group of “The wrong type of women” be thrown out of a con­ven­tion on the whims of a twit­ter mob, most of whom were not at­tend­ing the con­ven­tion, is dis­tress­ing. I think the word I am look­ing for is “Injustice.” Not very many things make me an­gry, but the cow­ards and bul­lies run­ning Calgary Expo make me an­gry now be­cause they have know­ing­ly car­ried out an in­jus­tice for their own po­lit­i­cal ex­pe­di­en­cy. This is a sig­nal that if you do not pass an ide­o­log­i­cal pu­ri­ty test then you are not al­lowed an equal plat­form. This is a real world ex­am­ple of expo or­ga­niz­ers and so­cial me­dia mobs shout­ing “GO HOME GAMER GIRL! !” to The Honey Badgers, most of whom are fe­male. 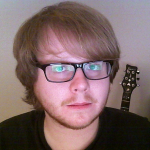 This mir­rors ear­li­er events where two sep­a­rate Vivian James cos­play­ers were ha­rassed, threat­ened and then abused at Magfest 2015, with one vic­tim be­ing a staff mem­ber of the even who went on to write a de­tailed ac­count of the in­ci­dents. It also mir­rors the at­tempts to ban ac­tor Adam Baldwin from Supernova Expo in Australia. Unsafe Safe Spaces, Exclusionary Inclusion Policies. This is the po­lar­iza­tion and politi­ciza­tion of the con­ven­tion cir­cuit. This is cre­at­ing an en­vi­ron­ment that is un­wel­com­ing and the op­po­site of “safe”; where ob­jec­tions from peo­ple with the right con­nec­tions can have you eject­ed and banned at any point ar­bi­trar­i­ly. 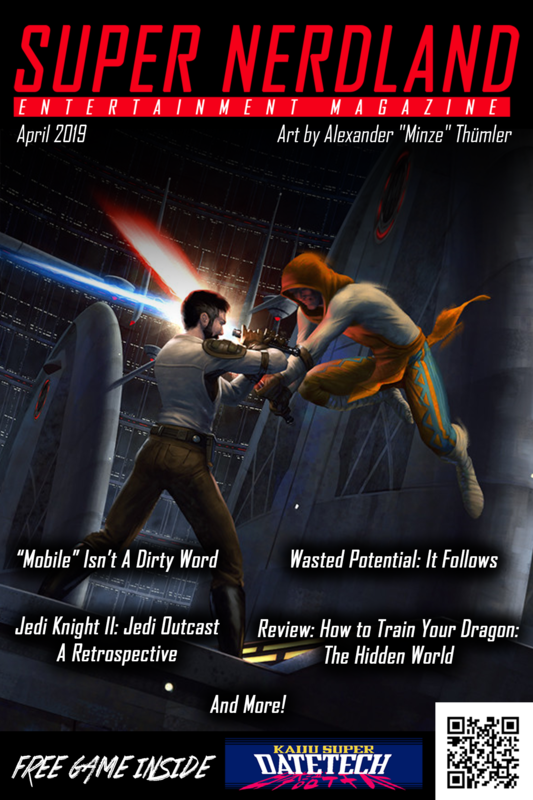 The Honey Badgers are open­ly sup­port­ive of GamerGate. They’ve nev­er hid­den that fact. Once Calgary had ap­proved them, it was al­ready too late. Now we have the worst of both worlds: you got the hopes up of these peo­ple, made them do a ton of work in cre­at­ing mer­chan­dise and then banned them once they had set up. This is pret­ty cru­el and could have been avoid­ed by ei­ther: hav­ing the most ba­sic back­ground checks on hand if you re­al­ly do want to turn your con­ven­tion into a no‐go zone for GamerGate sup­port­ers, or by hav­ing some hu­man de­cen­cy and al­low­ing them to con­tin­ue with their booth as long as no rules were bro­ken. Calgary had a much tout­ed pro­gram called #ExpoEquality, where they claimed to be mak­ing a push to­wards in­clu­sion, but as some have point­ed out, their treat­ment and ejec­tion of the Honey Badgers proves them false. In April of this year, the Honey Badgers plan to put on a booth at the Calgary Comics and Entertainment Expo! We plan to in­fil­trate nerd cul­ture cun­ning­ly dis­guised as their own. Each of us has been care­ful­ly craft­ing a per­sona of nerdi­ness through decades of ded­i­ca­tion to comics, sci­ence fic­tion, fan­ta­sy, com­e­dy games and oth­er geek­ery, wait­ing for this mo­ment, our mo­ment to slip among the un­aware. Once there we will start dis­trib­ut­ing the to­tal­i­tar­i­an mes­sage that nerd and gamer cul­ture is… per­fect­ly won­der­ful just as it is and should be left alone to go its own way… Just let­ting cre­ative com­mu­ni­ties cre­ate; con­sumers con­sume what they want; and gamers get down to the busi­ness of vidya with­out be­ing judged. I be­lieve Videogames and Comics are won­der­ful too. If you’ll ex­cuse me, I have to go and lie down for a while and con­sid­er what kind of com­mu­ni­ty would ban artists and fans for the crime of up­hold­ing and pro­mot­ing these be­liefs. Note: This ar­ti­cle has been edit­ed to fix a few gram­mat­i­cal er­rors. Also cor­rect­ed “The Honey Badgers also re­leased the au­dio of the “con­fronta­tion” with se­cu­ri­ty…” as it was in­cor­rect. “The Honey Badgers also re­leased the au­dio of the “con­fronta­tion” at the pan­el…” is the cor­rect­ed line. Note 4(5:05pm EST 4/20/2015): This sto­ry just does not stop! On Sunday, a group of peo­ple that in­clud­ed The Honey Badger Brigade had the cops called on them by Calgary Expo se­cu­ri­ty. Their crime? They were hang­ing out at a park… We can’t make this up. Meanwhile, The Honey Badger Brigade has re­leased a state­ment on their web­site say­ing that they will have a “sig­nif­i­cant press re­lease” lat­er to­day. The word we have is they have been able to ob­tain le­gal rep­re­sen­ta­tion, so it will be in­ter­est­ing to hear what comes out of this de­vel­op­ment. We will keep you post­ed!